Nubble is once again at the start of a journey. For nineteen months, he has worked hard to learn the skills and behaviors of a service dog. 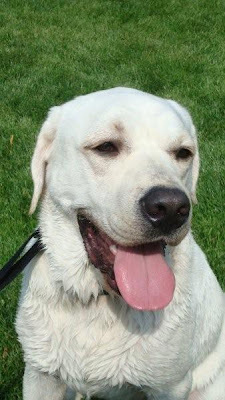 He has matured into a fun, loving dog who loves to work and please others. But Nubble has decided to take a new path. 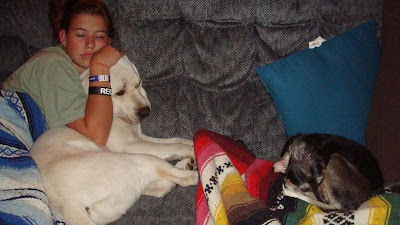 Instead of becoming a service dog, Nubble is going to find his forever home as a beloved pet. Not all of the dogs who begin our service dog program graduate as working service dogs. Some dogs have personalities and traits that better suit them for other careers as police dogs or explosive detection dogs. Other dogs make people very happy as family pets. Nubble met with the state police to see if he would be a good fit for their program. After going through their evaluation, we learned that Nubble would be happiest as a family pet. Whenever a dog is released from our program, we always find a loving home for him. Donna and her family are unable to adopt Nubble, and we are currently going through the adoption process. We will make sure that Nubble's new home is a good match for both him and the family so that everyone will be happy. "This will be very difficult for me," says Donna. "It seems that him being someone else's family pet is a let down for me. But I keep telling myself what another puppy raiser said to me: 'I wanted my son to be a lawyer, but he is an artist. It may not be what I had planned for him, but he is good at it and he likes what he does.' 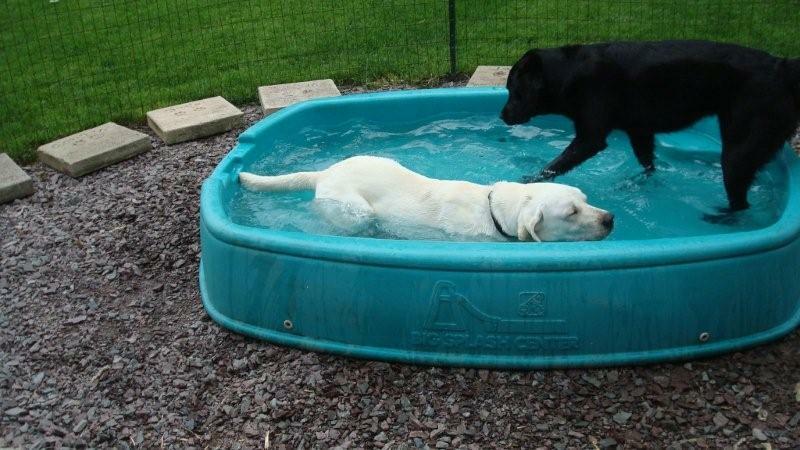 "
Sometime after Nubble joins his new home, Donna plans to continue being a puppy raiser for us. We're very happy that she has decided to raise another puppy. "I love being a part of SSD," says Donna. "I have learned so much from Nubble that I think the best thing to do would be to take that knowledge and continue to learn and grow as a puppy raiser. But, boy, will I miss him." While we search for a good match for Nubble, he continues to live with Donna and her family, and she continues to work with him on his skills. After all, he does love to work and learn new things. They've been practicing walking on strange surfaces like grates, trash bags and a rough board. They went to the grocery store, and when Donna saw a Golden Retriever nearby, she gave Nubble a cue to keep him busy, and he stayed focused on her. He knew there was a dog nearby, but he used his self control and ignored the other dog. 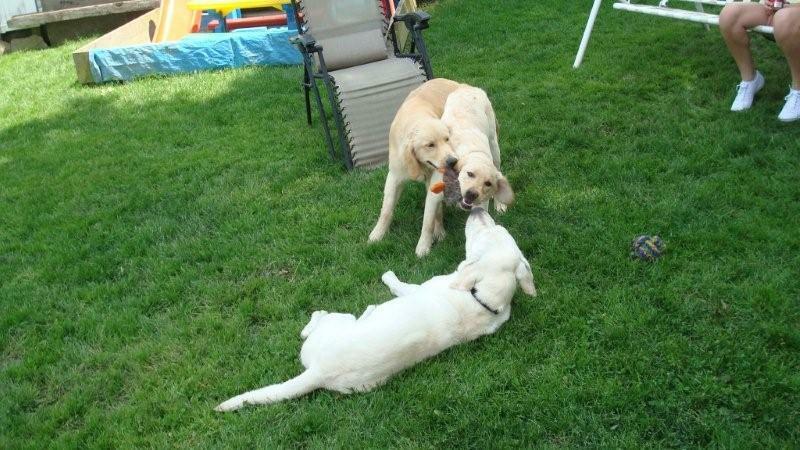 Nubble even met the new puppy, SSD Lewey, and did very well. He barked for a while until Donna moved him into another room to calm down, but then he was able to greet Lewey. 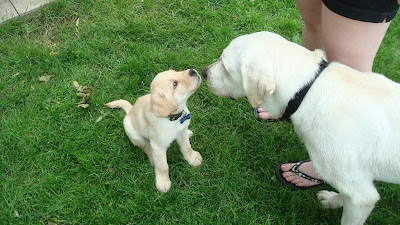 Lewey was a big help for this first meeting because he stayed focused on his own puppy raiser, and Nubble ended up ignoring him. 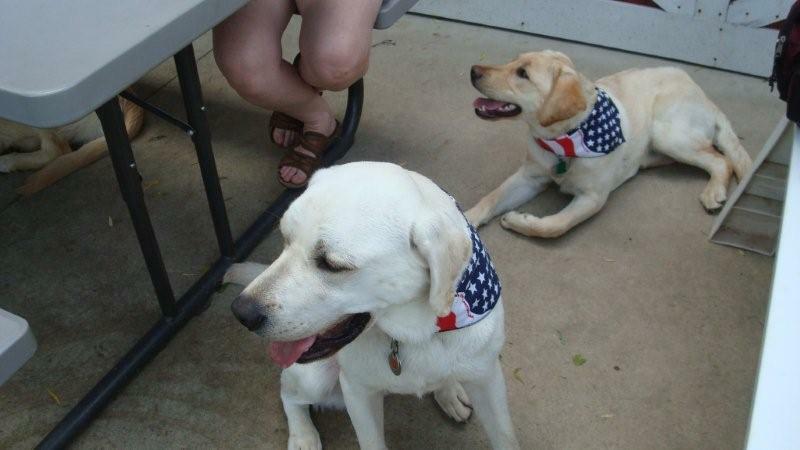 Over Memorial Day, the Northeast Puppy Raisers had a picnic at one of the puppy raiser's houses. 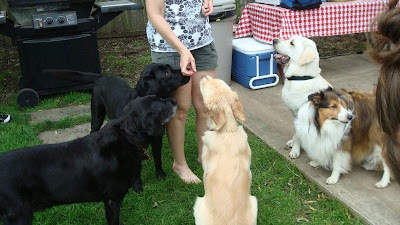 Nubble had a great time playing with SSD Ben, Slate, Cassie and Lewey, as well as two family dogs. He also got to meet two Shelties that were visiting for a few hours. Nubble did very well with all of the dogs. The puppy raisers organized some dogs games, including a version of musical chairs where the people couldn't sit until the dogs did. The dogs also got to bob for biscuits. (Little Lewey bobbed for Cheerios instead of biscuits.) Slate won bobbing for biscuits and Nubble came in second. 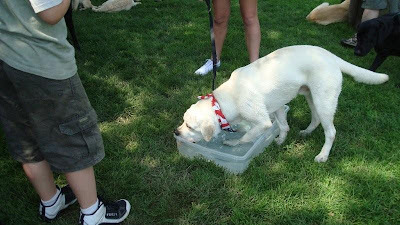 Nubble even tried to go swimming in the dog pool! The water was only eight inches deep, but Nubble lay down and moved his paws! He's quite a character. "Nubble is a fantastic dog," says Donna. "He makes me smile every day. I'm glad he will make someone else smile, too."